Let your experience the pride of owning a Mitsubishi car tool! Exclusively for Mitsubishi vehicle owners. 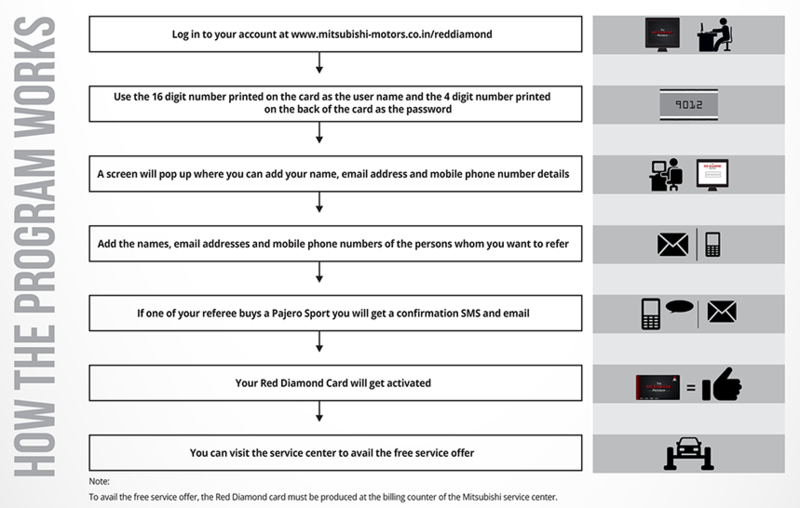 Visit www.mitsubishi-motors.co.in/reddiamond and enter the details you find on the Red Diamond card to enroll yourself. Refer/Invite your friends, family or colleagues to buy a Mitsubishi Pajero Sport. You can refer/invite as many persons as you wish to. If two of your referees buy a Pajero Sport, you get ₹25,000* for each of the referees (totalling ₹50,000) of free service and related genuine spares free from Mitsubishi authorised dealership. 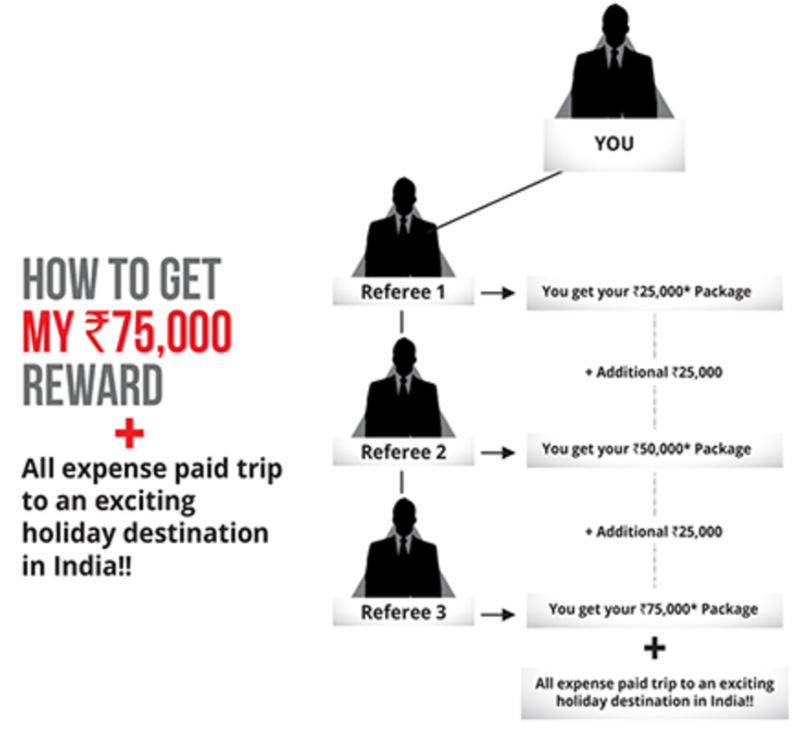 If three of your referees buy a Pajero Sport, you get ₹25,000* for each of the referees (totalling ₹75,000) of free service and related genuine spares free from Mitsubishi authorised dealership and an all expense paid trip to an exciting holiday destination in India!! 1. Who can participate in the Red Diamond program? Mitsubishi vehicle owners are eligible to participate in the Red Diamond program. 2. How many persons can I refer? You can refer any number of persons anywhere in India. 3. Can the referred person buy any Mitsubishi vehicle? The referred person needs to a buy a Mitsubishi Pajero Sport. If one of your referees buys a Pajero Sport, you will be getting ₹25,000* worth of free service and genuine spares from Mitsubishi. 5. What happens if my referee has been referred by another person? Only the person who referred first will be considered. 6. Do I get more benefits if more than one of my referees buy a Pajero Sport? 7. Can I receive the benefit in cash? No, the ₹25,000* can be used to only avail free service and get related genuine spares from Mitsubishi. 8. How will the reward package get added to my account? If a referee buys a Pajero Sport you will get a communication intimating you’ve got ₹25,000* worth of free service and related genuine spares from Mitsubishi authorised dealership. 9. Do I have to use the entire amount in one transaction? Partial redemption of the amount is allowed until the balance gets exhausted. 10. Will the data about the referred persons be kept safe? It will be kept confidential by Mitsubishi. 11. Will some else be able to see my account details? No, the account details are personalized and only you will be able to see them. 12. What happens if I lose the card? All you have to do is contact your nearest Mitsubishi dealer and get a free replacement card. 13. Which service center can I use to service my Mitsubishi vehicle? You can use the service in any authorised Mitsubishi service center and please carry your Red Diamond card and produce it at the billing counter.